Good morning! 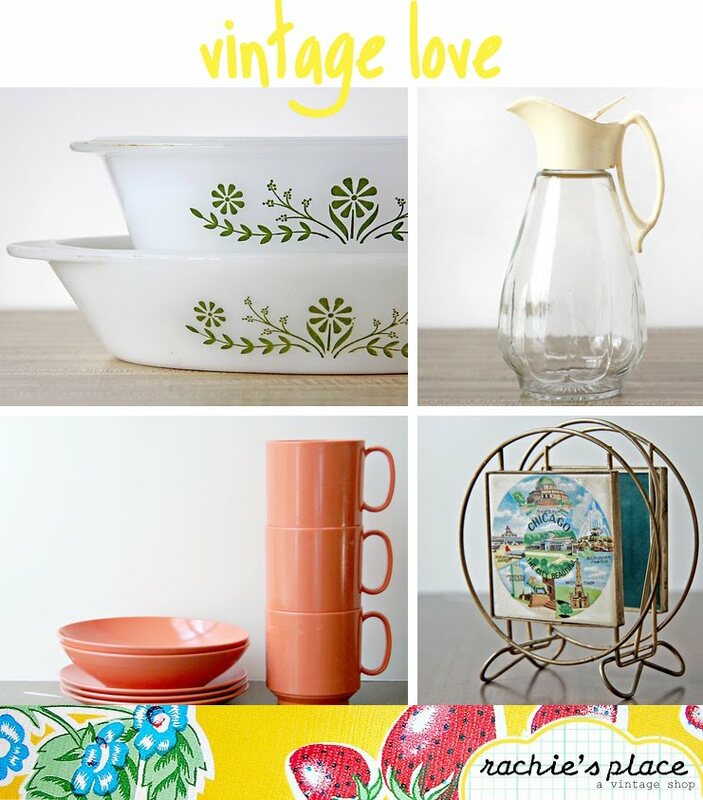 This week's Vintage Love features Rachel of Rachie's Place. Rachie's Place carries a great variety of vintage housewares. I love so many things about vintage that I am not sure I could list them all! I do know that I love and truly appreciate the history. I want to know who owned everything I find. To think that the pieces I bring home were once part of another family's history is absolutely wonderful. What is the best thing you have ever come across when you have been vintage/thrift shopping? Oh my, that's another tough question. My current favorites are anything Pyrex and ceramic pots/planters (McCoy, USA, California). I think that the best find ever was from last year. I stumbled upon this ceramic bluebird pitcher, shakers, and jam container, and my husband thought it looked like junk and I left it all behind. But when I researched those bluebirds at home and discovered they were valuable, I went back the next day and brought it all home with me. It took one day to sell the entire set. I felt a little bad about it (I wanted it for myself) but I came across the same salt and pepper shakers about a month later. They are now tucked safely away in my dining room breakfront. I am not sure I have a particular method. I go when I have the time to go because I do work a job outside of the home. I try to go during the weekday as the weekends are when people clean and donate! I try to stick to thrift stores that are in more established neighborhoods because that is where the really great stuff is found (older neighborhood = older people). I also look at the bottom of everything. I have spent the past 12 years of my life antiquing with family and have learned that much can be said about a piece if you take a moment and really inspect it. Somewhere there will be a mark, stamp, label, sticker, imprint, something that will guide you in the search for more information. I have actually gotten looks from other shoppers because I am constantly flipping things over. If you aren't totally in love with something you find, leave it behind! Someone's trash WILL eventually become someone else's treasure. Thank you Rachel for participating in this week's Vintage Love. Photos courtesy of Rachel, Rachie's Place. Of course! I'm so glad you enjoyed it.